According to this one article: “Motorola Solutions has become the latest maker of Android and Chrome OS devices to license related patents from Microsoft, joining dozens of other companies that have entered into similar agreements with Redmond. “Note, however, that we’re not talking about Motorola Mobility, the Android smartphone maker that Google bought in 2011 and recently sold off to Lenovo. This is probably more to do with PR (promoting the idea that Android is infringing) and not much with actual payments, for the OIN’s CEO told us that deals like that mostly involve FAT patents and Google was abandoning ActiveSync, which was another extortion vector, a couple of years ago. Google probably knows what this deal really involves (it has many patent lawyers now) and quite sincerely we don’t think that this part of Motorola does anything significant with Android or Chrome OS. It’s more to do with PR for Microsoft, namely being able to name “Motorola” as part of the racket. It almost gives the racket some legitimacy because many associate Motorola with Google, Android’s patron. Microsoft was unsuccessfully pursuing a similar deal with a Chinese rising giant, Huawei ((unlike ZTE but more like the part of Motorola now managed by Lenovo). Some years ago and the press reported about Huawei discussions and nothing has happened since then. It’s the one big fish Microsoft can’t get ahead of and enlist for the FUD campaign. 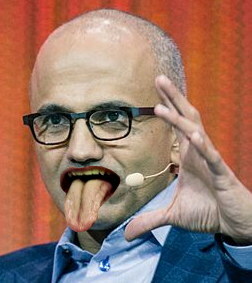 If this is Microsoft’s principal strategy, then it will find itself portrayed as a villain and a racketeer/criminal (correctly so), alienating many developers, OEMs and in turn losing focus on its own products (if any are left which are viable).